Best when viewed at 1024 x 768. 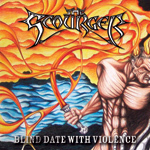 220 VOLT "Eye to Eye"
The Scourger is a new band from Finland. They have only three years of existence and so far they have released a demo CD, an EP and a CD-single. The band has in their ranks vocalist Jari Hurskainen and guitarist Timo Nyberg, both used to be members in Finnish melodic death groovers Gandalf. In the first month of 2006 the band released their debut album through Stay Heavy Records. The band included nine tracks and almost forty minutes of pure melodic death metal music combined with some touches from thrash metal. Definitely their compositions are well developed with some very impressive ideas and a killer singer. Believe me Jari has a very good voice and he uses it very well in this album. Generally the band included some of their finest ideas inside this record and I am sure that the fans of melodic death metal will adore their stuff. ©2002-2005 Power Play Records®. All Rights Reserved. Duplication of any part of this website is a violation of applicable laws.